ELIZABETHTOWN – Four Bladen County departments responded for a reported dwelling fire on Sunday, July 19 at approximately 15:00 hours. ASHEVILLE – After 400 miles, countless flat tires, broken spokes and an IV bag or two, the 30 firefighters who biked into town Friday didn’t complain when they were met with a vicious thunderstorm at the final leg of their cross-state journey. IREDELL COUNTY – A fire, likely sparked by lightning, destroyed a large chicken house and killed the 9,000 chickens inside Wednesday night on South Chipley Ford Road. SHELBY – A fire department celebrated renovations by dedicating its station back to the community it serves. ROWAN COUNTY – The Salisbury Planning Board gave thumbs up for a planned training facility for firefighters at Rowan-Cabarrus Community College. ROANOKE RAPIDS – After 44 years fighting fires, Roanoke Rapids Fire Chief Gary Corbet will be heading into retirement in Myrtle Beach, S.C. beginning in September. MORGANTON – Nearly one-third of the Wright Table Company furniture factory was left in ruin Monday evening after lightning reportedly sparked a fire in the plant’s finishing room. WILMINGTON – Members of several fire departments from the Carolinas and Florida are packing up Sunday and heading to Wilmington to begin the first ever Carolina Brotherhood Ride. CAROLINA BEACH – As of 11:43 p.m. Saturday night, crews are winding down at the scene of a fire off the shore of the Seabreeze community, as they monitor hot spots. 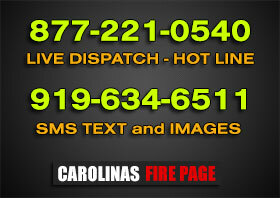 CABARRUS COUNTY – Firefighters from several counties responded to a well involved dwelling fire Thursday afternoon.